Gusty, south winds elevated wildfire danger in central and western parts of Oklahoma Monday afternoon, the National Weather Service reported. Winds gusted up to 37 mph at 4 p.m. at Will Rogers World Airport in Oklahoma City. 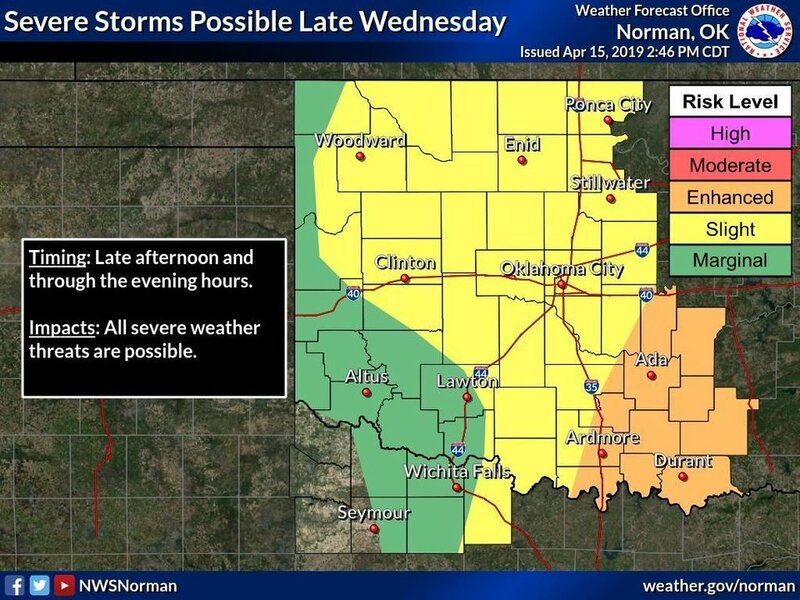 There is a risk for storms Wednesday in Oklahoma City, the weather service reported. Strong to severe thunderstorms are possible late afternoon through the evening hours. Hail is possible with high winds. The high temperature Monday will be 78 degrees. Sunny skies are ahead Tuesday with a high temperature of 76 in Oklahoma City. Monday night: Mostly clear with a low around 58. South wind 18 to 22 mph with gusts as high as 31 mph. Tuesday: Mostly sunny with a high near 75. South wind 17 to 21 mph with gusts as high as 29 mph. Tuesday night: Mostly cloudy with a low around 62. South wind 15 to 18 mph with gusts as high as 25 mph. Wednesday: A 20 percent chance of showers and thunderstorms after 1 p.m. Mostly sunny with a high near 78. South wind 15 to 21 mph with gusts as high as 29 mph. Wednesday night: A 30 percent chance of showers and thunderstorms mainly before 1 a.m. Mostly cloudy, with a low around 51. Thursday: Mostly sunny with a high near 66. Still appears that severe weather will remain possible on Wednesday, mainly late in the afternoon through the evening hours.